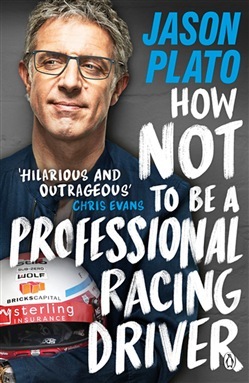 Pre-order your copy of the full-throtle memoir, How Not to Be a Professional Racing Driver, now! My name is Jason Plato. Two-time championship-winning and record-breaking racing driver, television presenter, voiceover artist, pilot, bon viveur, hedonist, robber, former inmate of the Monaco police department and a living, breathing example of what you shouldn't do if you want to become a professional racing driver. That's not some idiotic tabloid claim, by the way. That's genuinely who I am. I drink, I smoke, I don't go to the gym and I rarely stick to the script when talking to the media. Yet I'm still racing, and at the same level I was when I first won a seat with the Williams Touring Car Team over twenty years ago. It's no coincidence that I've won more races in the British Touring Car Championship than any other driver and over twice as many as the drivers who've won more championships. Then again, it's also no coincidence that I once spent several days in prison in Monaco for stealing a JCB. There is nothing sensible, predictable or considered about me, I'm afraid. This is my story. Acquista How Not to Be a Professional Racing Driver in Epub: dopo aver letto l’ebook How Not to Be a Professional Racing Driver di Jason Plato ti invitiamo a lasciarci una Recensione qui sotto: sarà utile agli utenti che non abbiano ancora letto questo libro e che vogliano avere delle opinioni altrui. L’opinione su di un libro è molto soggettiva e per questo leggere eventuali recensioni negative non ci dovrà frenare dall’acquisto, anzi dovrà spingerci ad acquistare il libro in fretta per poter dire la nostra ed eventualmente smentire quanto commentato da altri, contribuendo ad arricchire più possibile i commenti e dare sempre più spunti di confronto al pubblico online.